This document is a supplement to the President’s 2018 Budget request submitted to Congress on May 23rd, 2017, and serves as the Annual Report for the National Nanotechnology Initiative (NNI) called for under the provisions of the 21st Century Nanotechnology Research and Development Act of 2003 (Public Law 108-153, 15 USC §7501). The report also addresses the requirement for Department of Defense reporting on its nanotechnology investments, per 10 USC §2358. The President’s 2018 Budget provides $1.2 billion for the NNI, an investment in support of innovation promoting America’s interests, including competitiveness, economic growth, and national security. The NNI investments proposed for 2018 reflect an emphasis on broad, fundamental research in nanoscience to provide a continuing pipeline of new discoveries that will enable future transformative commercial products and services. The President’s 2018 Budget supports nanoscale science, engineering, and technology R&D at 12 agencies. 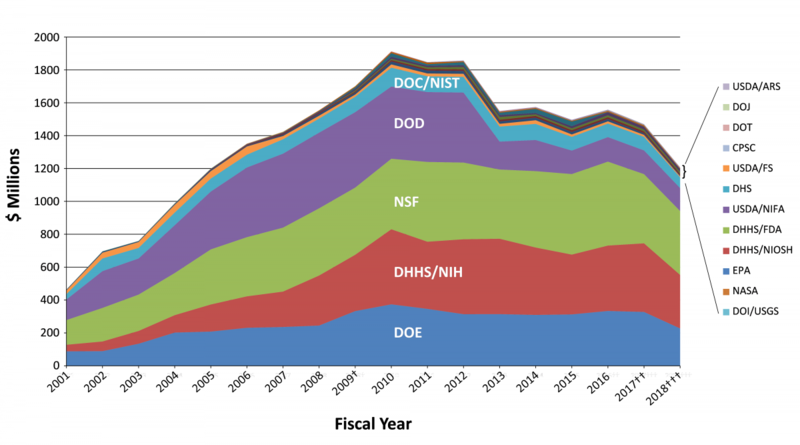 See the graph above for funding trends since the inception of the NNI; see the Acronyms page for agency abbreviations. The NNI Supplement to the President’s 2018 Budget documents progress of the NNI participating agencies in addressing the goals and objectives of the NNI. 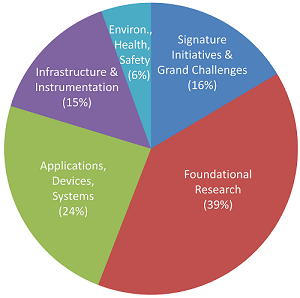 As called for in the 21st Century Nanotechnology Research and Development Act, NNI investments are categorized by Program Component Area (PCA). The PCA breakdown for the 2018 Budget can be seen in the pie chart on the left. 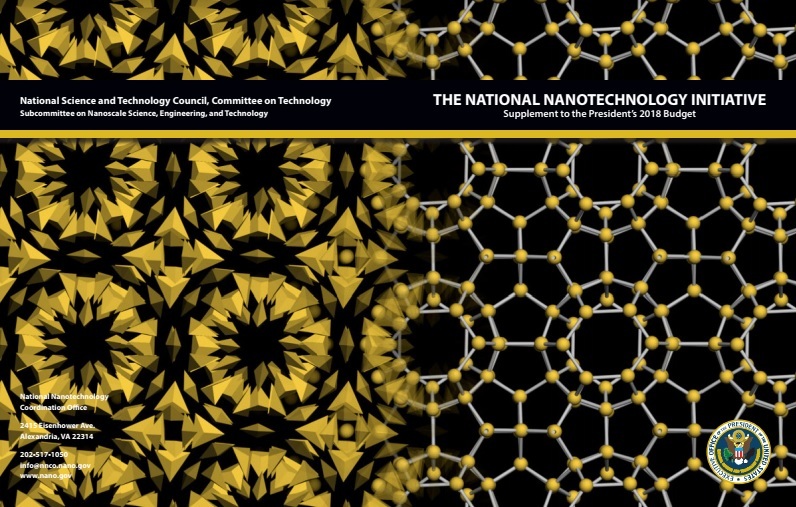 Each year’s National Nanotechnology Initiative Supplement to the President’s Budget features cover images illustrating recent developments in nanotechnology stemming from NNI activities that have the potential to make major contributions to National priorities. Gold nanoparticles in the shape of two short pyramids attached at the base (250 nm on the long edge and 177 nm on the short edge) self-assemble into complex three-dimensional cages when coated with custom-made DNA. The DNA strands on the nanoparticles cross-link with each other, enabling the self-assembly. This approach has the potential to open up a new class of materials. These complex synthetic cages, with pores that can possibly hold cargo, have potential applications in sensing and storage, as well as medical diagnosis and drug delivery. The back cover (left side above) shows a simulation of assembled gold nanoparticles, and the front cover (right side) depicts the same structure in a ball-and-stick layout to highlight the cage arrangement. This work was the result of a collaboration between researchers from the Mirkin laboratory at Northwestern University and the Glotzer laboratory at the University of Michigan. This research was supported in part by the Center for Bio-Inspired Energy Science, an Energy Frontier Research Center funded by the U.S. Department of Energy, as well as the Department of Defense and the National Science Foundation. See Science 355, 931-935 (2017) for details (science.sciencemag.org/content/355/6328/931.full). Images courtesy of S. Lee and M. Spellings, The Glotzer Group, University of Michigan. Images illustrate examples of NNI educational outreach activities. Clockwise from top left: Nano Nuggets (www.nano.gov/nanotv) are short videos featuring experts, visionaries, and students sharing their thoughts on nanotechnology; EnvisioNano (www.nano.gov/envisionano) and Nano Film (www.nano.gov/VideoContest) highlight the accomplishments of the NNI to help educate the general public about nanotechnology; The U.S. Nano & Emerging Technologies Student Network (www.nano.gov/StudentNetwork) raises awareness of current research and cutting edge technologies, promotes opportunities, and provides an interdisciplinary community for undergraduate students. This network organizes the annual Student Leaders Conference; Generation Nano: Small Science, Superheroes! (www.nsf.gov/news/special_reports/gennano/index.jsp), a competition presented by the NSF and the NNI, asks high school students to design nanotechnology-enabled gear for an original superhero and create a comic/video featuring their hero using the gear; Animations (www.nano.gov/TargetCancerCells) on nanotechnology are prepared by university graphic design students. The NNCO develops the scripts and provides technical guidance during the project. 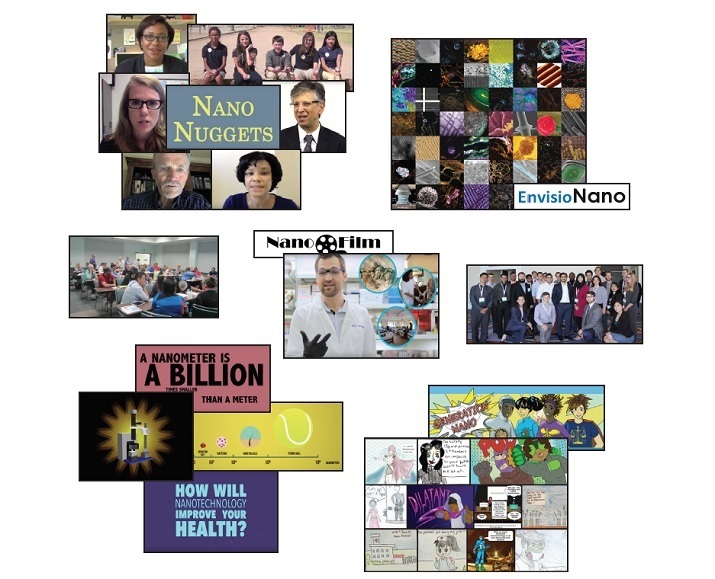 ; The Teaching Nano & Emerging Technologies Network (www.nano.gov/TeacherNetwork) connects teachers to facilitate access to classroom-ready resources and share best practices. The network hosts webinars featuring educators.